A new round of funding designed to help people get online and develop essential digital skills was launched today (30 January) by Minister for Public Finance and Digital Economy Kate Forbes at Big Hearts Community Trust in Edinburgh. 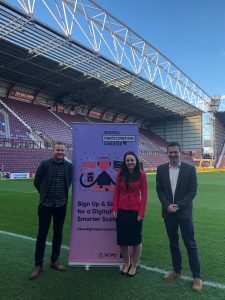 Over the past five years, the Scottish Council for Voluntary Organisations’ (SCVO) Digital Participation Charter Fund – supported by the Scottish Government and BT – has provided funding to over 160 projects across Scotland, with over 16,000 people being supported to increase their essential digital skills. The fund provides small grants of up to £10,000 to help a range of organisations tackle poverty, social isolation and other forms of inequality in society through embedding essential digital skills development work in day-to-day activity with their service users. Now SCVO has launched another round of the Charter Fund, in an attempt to reach and support even more people in need. Various organisations benefitted from the previous round of the Charter Fund. Community Food Initiatives North East, which is working to develop the essential digital skills of their volunteers, staff, and food bank beneficiaries. Atrium Homes have also recruited a part time Digital Assistant and are currently surveying the digital skills needs of their tenants before developing and embedding regular digital skills drop in sessions, supported by newly trained digital champions, as part of their customer service support. Deafblind Scotland are using their Charter Fund support to equip deafblind people with the digital skills and confidence to maximise the use of assistive technology to support them in their everyday information needs. Scotland is already a ‘digital nation’, with eight in ten households connected to the internet, and six in ten people using smartphones. However research conducted by SCVO’s Digital Team recently, in conjunction with the University of the West of Scotland, showed that around 21 per cent of adults in Scotland still don’t have basic digital skills.